it's the time for miracles, you heal all wrong! 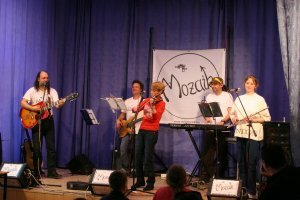 The MOZAIK-band was formed in 1990. Five people coming from five different fields — classical, jazz, pop, rock and folk music. We’ve brought our taste/colour to the group and result is a various, complex, mosaic-like music. Our style, for lack of better, is called ’jazzfolk’. We combine the motifs of European, American, African peoples music with modern sound and a lot of improvization. (But basicly we play our own songs using resources in a creative way and not simply reproductions of other songs. Can be say, we belong to the ’world-music’.) The acoustic and classical instruments (12strings guitar, violin, flute), and the modern electronic instruments (bass guitar, drumcomputer, synthesizer), can easily get along with the 3 voices. May Warmth and Light always be yours! Because we use a small amount of technical equipment we have no problem travelling place to place. Our show is specifically good (because of uniqueness and curiosity) for exclusive programmes, (because of informality) for youth clubs, school programs, first form balls, pregraduation balls, etc. We hopefully await for your interest in further information, ordering casettes/CD-s or invitation to perform. Power of Mind don't overcome Soul!